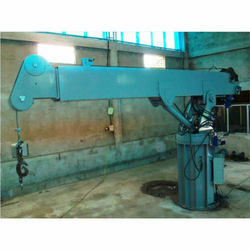 We are one of the leading manufacturer of Hydraulic Marine Crane. From past many years, we are into the manufacturing of Hydraulic Marine Cranes. These cranes are highly functional and are high in performance. We stringently work on the reliability and durability of these cranes so that they are able to meet the needs and requirements of our esteemed customers. Our experts also perform various tests to assure its quality and performance. Moreover, we are offering these cranes in no time constraint and at market leading prices.